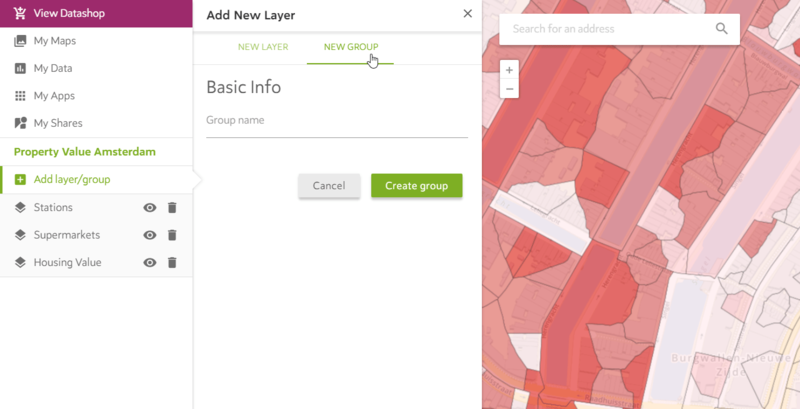 Have you created a map with multiple data layers that you want to group in a particular category? In that case the grouping of data layers might be an interesting feature for you. This functionality allows you to categorize your layers into groups. In this example we will group the layers with shop locations and we will group the real estate statistics by postal code. 1. In this visualization we can see two point layers with supermarkets and metro stations in Amsterdam. There is also an area layer with real estate statistics by 6-digit postal code. In this example we will create a group of the point layers and a group with the real estate statistics. 2. Click ADD LAYER/GROUP button. 3. Name your group and click CREATE GROUP. 4. Drag and drop the map layers into the particular group. 5. Create more groups for your other data layers. 6. You have successfully created multiple data layer groups. This allows turn multiple map layers on/off at once.